This Week Is Your Week to Make a Difference! In a society where a monumental act of violence takes place — killing thousands of people and traumatizing millions more — and is then used to launch a permanent war abroad and usher in draconian policies at home, there will inevitably spring up a movement for real truth and justice. The Western media, ever subservient to power and wealth, has tried for seventeen years to convince the public that this movement is nothing more than a gaggle of “conspiracy theorists,” when in reality we are the true champions of justice. Every disparaging article, misleading TV segment, and mindless tweet only serves to strengthen the case that they don’t really care about the victims and their families, nor about maintaining a civilized society governed by truth and reason. As the true champions of justice, this is our week to fight back. Many of us work day in and day out to raise awareness and build support for a new investigation until a critical mass is reached. But this is the week when we must all come together to amplify our message as one. 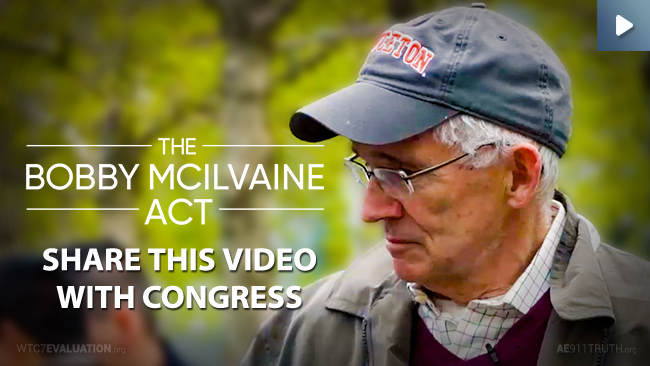 Step 1: Send the New Bobby McIlvaine Video to Congress Today! Today, we ask you to send, with just a few clicks of a button, our brand new pre-written letter to your members of Congress, urging them to watch the half-minute Bobby McIlvaine video and introduce the Bobby McIlvaine Act. Like last year, when we first launched the Bobby McIlvaine campaign, our goal is to have 1,000 people contact their representatives by the end of this week. Tomorrow, we’ll post the half-minute Bobby McIlvaine video on Facebook. As soon as we do, we’ll send an alert reminding those of you on Facebook to share the video. It’s critical that we get thousands of shares in the first few hours after the video is released — so please do your part and be instrumental in helping it go viral on 9/11! Finally, we invite everyone to attend the 9/11 Justice for All events in Washington, D.C. For those of you who cannot attend, we invite you to watch both the 2:00 PM rally at the U.S. Capitol and the 6:30 PM “Evening of Truth-Telling and Music” via livestream on the Bobby McIlvaine webpage. Please also consider making a donation, however small or large, to help us cover the considerable cost of the rally at the Capitol and travel expenses for our speakers. P.S. — For those of you in the New York area, we’re also co-hosting an event with the Lawyers’ Committee for 9/11 Inquiry on September 10th at the Jefferson Market Library, where Richard Gage, Bob McIlvaine, and Matt Campbell, among others, will be speaking. Doors open 6:00 PM and the event gets underway at 6:30 PM. We hope to see you there!